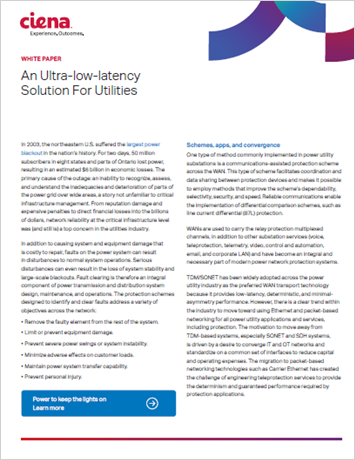 There is a growing trend in the power utility industry to move away from traditional synchronous optical network/synchronous digital hierarchy (SONET/SDH) systems for wide-area network (WAN) communications. Information technology (IT) teams and equipment manufacturers are encouraging utility communications engineers to implement Ethernet-based packet transport solutions that offer greater bandwidth efficiency. This technology migration comes with a challenge; engineers must now figure out how to design packet based pilot channels that still meet the strict performance and determinism requirements essential for supporting protection applications. To solve this problem, this paper introduces a deterministic packet transport method of achieving guaranteed latency for critical traffic being transported over Carrier Ethernet WANs. Latency, asymmetry, and packet delay variation (jitter) performance data are discussed to show the ability of the deterministic packet transport method to support a line current differential protection channel across a Carrier Ethernet WAN transport network topology.